Several years ago I read a book, The Origins of the Irish, by the famed archaeologist J. P. Mallory. Unfortunately, I remember very little of this work, and recall thinking that it was published just a bit too early, as archaeogenetics was clearly going to revolutionize our understanding of the prehistory of Northern Europe, though no clear results were on hand at that moment. 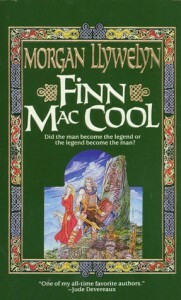 In contrast, I recall much more clearly the novels of Irish historical fiction author Morgan Llwelyn, which I read over twenty years ago, Red Branch, a retelling of the legend of Cú Chulainn, and Finn Mac Cool, tales of a semi-legendary hero. Cú Chulainn is a mythical character, resembling Indo-European archetypes of awesome warriors who were inevitably arcing toward a tragic end. I term Fionn mac Cumhaill semi-legendary because his notional descendants intersect with the life of Niall of the Nine Hostages, who most presume to have been a real figure, though cloaked in legend. The lives of Cú Chulainn and Fionn mac Cumhaill exhibit many dissimilarities despite the fact that both suffer tragic fates, Cú Chulainn in a violent death, and Fionn mac Cumhaill in some infamy. Cú Chulainn is a much more fantastic figure, who seems to have been born of a god and a daughter of the Gael aristocracy. 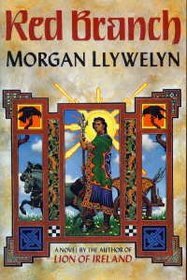 Llwelyn, in keeping with the majority, but not exclusive, tradition, depicts him as physically atypical for a Bronze Age Gael warrior, small, beardless, and very dark haired. In battle though he transforms into a monster. He is a Superman for his age. In contrast Fionn mac Cumhaill is fair haired, and scion of a people conquered by the Gaels, the Fir Bolg. His rise to power occurred as much through his wiles in ascending the ranks of the fianna militia, as much as his martial skills, and despite his pedigree rather than because of it. Fionn mac Cumhaill is perhaps the Batman of ancient Ireland, a dark hero despite exterior appearance. This rich corpus of myths makes the Irish distinct from the English, as observed by Norman Davies in The Isles. Ireland did not need a J. R. R. Tolkien to create its own epic cycle, it always had one. Not because of the foresight of one man, such as Snorri Sturluson, but the peculiar organic and gradual transformation of Ireland into a Christian nation, where local elites and sub-elites were organically co-opted into the new religion, which lacked the clear patina of Romanitas it took on elsewhere. The later cycles in which the lives of Fionn mac Cumhaill and Cú Chulainn were situated draw upon the world formed by the events of the Lebor Gabála Érenn, the Book of Invasions. Assembled during the medieval period, like Beowulf the Book of Invasions interlaces a world before Christianity and Roman history with a clear understanding of its place within a Christian and Classical historiography. As suggested in Wikipedia one motivation for compiling and creating the Book of Invasions was almost certainly to give the Irish the venerable history which peoples such as the Greeks and Hebrews had. But these sorts of constructions aren’t created out of whole cloth. Rather, they bring together extant folklore and legend and attempt to create a coherent whole. To create his legendarium Tolkien poured into his world dollops of much of the lore of the European North. Even the geography of Beleriand recapitulates Northwestern Europe. And oral societies can preserve much detail across thousands of years. Doug Jones points out that local Indians in the Pacific Northwest have a cultural memory of the explosion of Mt. 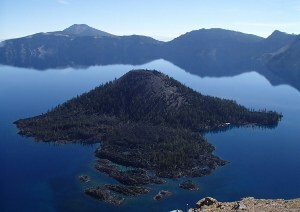 Mazama 8,000 years ago, which led to the creation of Crater Lake. Though we need not take the Book of Invasions, and the legends of pre-Christian Ireland literally, nor should we dismiss them as fiction without any historical content. The problem is that we need other avenues of exploring prehistory besides archaeology and myth. Modern Europe has been shaped by two episodes in prehistory, the advent of agriculture and later metallurgy. These innovations brought not only massive cultural change but also, in certain parts of the continent, a change in genetic structure. The manner in which these transitions affected the islands of Ireland and Britain on the northwestern edge of the continent remains the subject of debate. The first ancient whole genomes from Ireland, including two at high coverage, demonstrate that large-scale genetic shifts accompanied both transitions. We also observe a strong signal of continuity between modern day Irish populations and the Bronze Age individuals, one of whom is a carrier for the C282Y hemochromatosis mutation, which has its highest frequencies in Ireland today. The paper is open access. You should read it. And the supplements. Broadly speaking Ireland fits the template for much of Northern Europe. First there were hunter-gatherers. The Mesolithic people were almost certainly part of the same group which expanded rapidly out of refuges along Europe’s southern fringe during the Pleistocene. Hunter-gatherer genomes tend to exhibit indications of low population size, and are quite homogeneous. Second, there were the Neolithic farmers, who arrived from Anatolia. The modern population which is the best “fit” for this group today are the Sardinians. In Central Europe they began as the LBK, while in southwestern Europe they were the Cardial culture. Like the hunter-gatherers this set of cultures, radiating from a common source in western Anatolia, were genetically homogeneous, with little inter-group divergence. But, unlike the hunter-gatherers their population sizes were large. To varying degrees in various regions and times these people absorbed elements of local hunter-gatherer substrate. Their genetic distance from the European hunter-gatherers was very great, initially settlements in close proximity were as distant as modern Chinese and Northern Europeans in terms of variation. Additionally, they were physically distinct externally. The hunter-gatherers were by and large carriers of alleles which today are strongly correlated with very dark-skinned people, with the exception of mutations around the locus associated with variation in eye color in Europeans. Inexplicably the hunter-gatherers may have had pale eyes set against very dark faces. The farmers had dark eyes, but their skin was certainly much lighter. Finally you have the third group, which arrives in Northern Europe during the Copper Age with the Corded Ware culture, also known as the “Battle Axe” culture, between 4,500 and 5,000 years ago. There they seem to overwhelm the Neolithic farmer groups, which had overwhelmed the hunter-gatherers earlier. Genetically the Corded Ware were a compound of three groups, one with with deep affinities to the European hunter-gatherers, another with peoples from the Caucasus, and finally lastly a genetic imprint from ancient Siberians. By the time this group began expanding toward peninsular and maritime Europe it has certainly absorbed local genetic substrate. In Ireland the Neolithic culture climaxed in the form of a Megalith building complex of cultures which seemed to be strung out along the Atlantic fringe of Europe. This ceased with the arrival of the Bell Beaker culture around ~4,500 years ago. Two of the genomes are reasonable coverage, 10x. This might not be “medical grade,” but for population genomics this is pretty good (though I notice they didn’t run PSMC, which I think often requires more coverage). One individual is a female from a farmer culture who died ~5,000 years ago, and the other a male who died around ~4,000 years ago. The PCA above makes it clear that the female farmer is placed very near other early European Farmers (EEF), and the male (along with lower coverage confederates of similar provenance) smack in the middle of Bronze Age Northern Europeans. The admixture plot above confirms these findings. But there are some wrinkles. 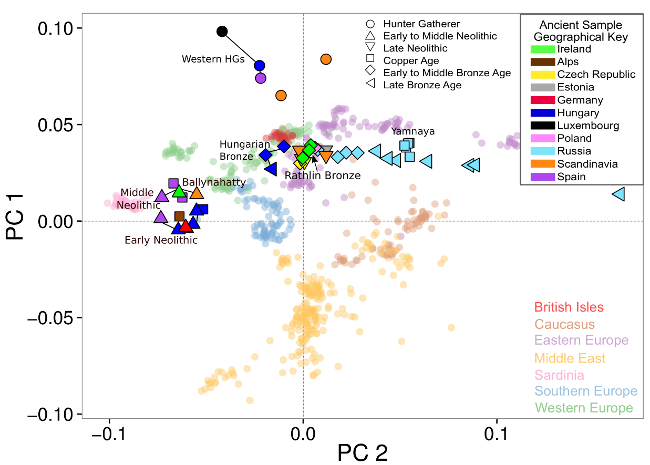 PCA, Admixture, and f and D-statistics indicate clearly that the Irish Neolithic female had more hunter-gatherer ancestry than earlier LBK samples. Second, the Irish Bronze Age males had ancestry related to early European framers. At one point they give an estimate of ~40 percent hunter-gatherer ancestry for the Neolithic female. To them this establishes that the arrival of farming to Ireland was a matter of demographics, not cultural diffusion. This aligns with what we’ve seen elsewhere. The transition between the hunter-gather to farmer seems to have been accompanied by a significant demographic rupture all across Europe. As one might have inferred from earlier work, the phylogenomic character of the Irish was roughly established during the Bronze Age. 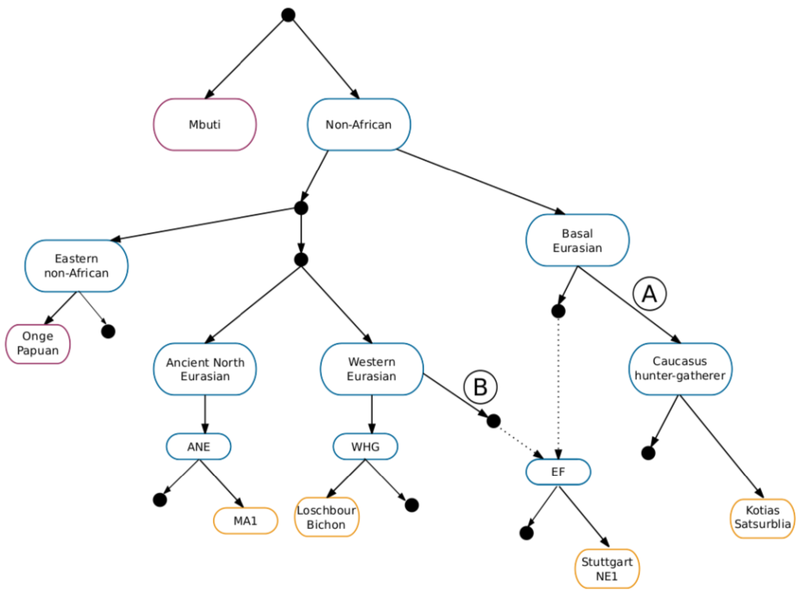 One of the primary issues with trying to make more precise analyses seems to be that the three root populations which contributed to the ancestry of modern Europeans were genetically rather homogeneous within themselves. That is, there was structure among European hunter-gatherers, but that which was not due to admixture (e.g., the Eastern European hunter-gatherers clearly mixed with a North Eurasian group) was subtle, probably due to rapid expansion from a small founder group after the Ice Age. The two other components had larger effective populations, but they too underwent rapid expansion, almost isotropically in some cases (e.g., along the North European plain), so there was little time to accumulate internal structure not due to admixture with local substrate. But some inferences can be made with various techniques, the details for which you should read the supplements. The Neolithic female seems to be descended from Cardial, and not LBK, early European farmers. 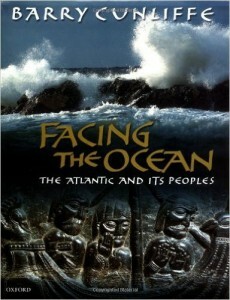 That is, the Irish Neolithic is connected to the Atlantic littoral, in keeping with Barry Cunliffe’s thesis in Facing the Ocean. Second, the excess hunter-gatherer ancestry in the Neolithic female exhibits greater affinities with the Loschbour hunter-gatherer from Luxembourg than hunter-gatherers from Central or Eastern Europe. T his indicates that as with the the situation in Spain there was local admixture with hunter-gatherers over time. In Mexico indigenous population structure persists in mixed regional mestizo groups. The same is likely true then in Europe if the above results hold (in the supplements you see a fair amount of evidence that Loschbour-like populations contributed to the ancestry of contemporary Western Europeans more than Eastern Europeans who may have more aggregate hunter-gatherer ancestry). Naturally this leads one to wonder if the early European farmer ancestry in the Bronze Age Irish samples was from the same group as that of the Neolithic farmer. The surprise is that there isn’t any strong evidence of admixture! Rather, there are better candidates for donor populations on the European continent. The most parsimonious explanation then is that the Bell Beakers mixed with early European farmers, and then rolled over the descendants of the Megalith builders in Ireland. But confidence in this sort of conclusion is weak, as the number of populations is finite, and one should be cautious about making too many inferences from a few samples (though modern Irish are actually a decent proxy for the Bronze Age Irish). The broader point here is again that though there are three broad populations coming together in any given target group, we don’t have a good sampling of all the constituent populations of the three source populations, nor a good grip on the internal substructure across these groups, in part because the structure itself was minimal to begin with due to recent demographic expansion. Whatever the details may be, the fact that dramatically different peoples were interacting during Irish prehistory should make us reconsider the veracity (or our dismissal) of legends pieced together from folklore and oral history. The Neolithic Irish female likely had a complexion similar to modern Southern Europeans (she was homozygous derived on both SLC24A5 and SLC45A2, so she was likely brunette white, rather than olive or brownish). But she and her descendants were possibly notable darker and physically different in mien from the Bell Beaker people, who were well on their way to becoming truly “fair and delightsome.” And yet it seems plausible that deep into the Neolithic period there were relic hunter-gatherers persisting in out of the way locales, inappropriate for agriculture. They may have looked very different indeed. It is easier to dehumanize when the Other looks different by their nature. The Greeks in the centuries after the fall of the great kingdoms of their Bronze Age Mycenaean forebears referred to the constructions of that period as cyclopean, as if only creatures of myth could have wrought such architecture. And yet the Greeks knew that the Mycenaeans were their ancestors, and the two groups shared a common language and broader culture! Oral history preserves memory; Troy was real, and it was part of the fringe of the Greek world. But it also distorts and confuses. The men of yore become legends, giants, monsters. What would the Bell Beakers have thought when they arrived to an Ireland where the civilization of the Megalith builders was collapsing, both due to exogenous shocks (the Bell Beakers!) and endogenous forces. In subsequent centuries perhaps the fairy folk had withdrawn to their own world, leaving their coarse but imposing constructions as a testament to their powers in the days of old, as they faded into mythology and legend. And it may be that Cú Chulainn, the son of the god Lugh, who was a Tuatha de Danann, is a recollection of the emergence to maturity of a man who fused the blood of the old people with the new, and whose dark features bore testament to a race whose legacy was fading in the land? Of course that is all speculation, but it is no longer unfounded. The book of Europe and ancient DNA is coming to a close in regards to outlines of the tapestry. We are in the phase of filling in details, and scholars need to truly become interdisciplinary, and marry what genes are telling us about demographics, with linguistics, archaeology, and folklore. The synthesis may be the closest to a time machine we get. 63 Comments to "The Gaels Were from Scythia"
Well megalithic mounds such as Newgrange etc were generally regarded as “Sidhe Mounds” (Sí = modern Irish spelling), of course part of rewriting of Irish history during 7-9th century emphasised the “mortal nature” of what were probably deities. The logical conclusion of this via Folk memory is the “Little people”, but of course in saga tradition the Tuatha Dé were anything but small. It should be noted that Fenian cycle (Fionn etc.) is more of early medieval origin, was extremely popular throughout the Gaelic world (Ireland and Scotland) and most of texts probably date to 10th/11th/12th centuries (with earliest poem back to 7th and latest stories in 16th century). The crafting of a “unified history” to tie in with Biblical/Classical history narrative led in sense to creation of a common identity/genealogy based around word Gael, whereas before hand you had more of a “tribal distinction”. Subsequently any newer arrivals post-hoc would be termed Gall, first the Vikings and than the Cambro-Norman’s/English you thus had situation where Cambro-Norman potentates in 16th century though speaking Irish regarded themselves as Gall due to their genealogy. Exactly. It's just globalist propaganda. Trying to invent fake identities for ancient peoples and moving them around in theory to justify the Tower of Babel mix of today and the redrawing of borders. The Basques have an unusually low affinity to these BA Irish for a population which carries a related paternal marker at close to 90%, but that’s not entirely surprising. The timeline of the IE invasion of Europe is starting to look like it will be relatively well understood within in the next year or so. I hope there will be similar efforts to understand the origins of Basques and Finno-Ugric people(and the population history of the their regions) soon. I have a feeling they will inspire more research into certain theories about the affinities of the Basque language which were shut down in the 90s by indigenists. You might be interested in the blog Old European Culture (Goran Pavlovic?). It has numerous long posts discussing connections between the Bronze Age Irish and the Balkans, and by extension the Steppe Indo-Europeans. The continuity in cultural artifacts, especially gold working, is quite striking. He, too, thinks that the myths contain more history than they are usually credited with. Wasn’t it the Picts who were said to have come from Scythia? Yes. Of course, shortly thereafter they clashed with the Nits, and the rest is history. People do say that about the Picts. Bede gives that account of Pictish origins, but it is "supposed to be confusing Scythia and Scandia, the Latin form of the Old English name for the southern part of the Scandinavian peninsula". As for Siegfried, the narrative’s central hero, he is obviously pure myth. Someone simply decided to insert this legendary dragon-slayer into the story of the Nibelungs because it seemed like a good idea. As this shows, epics are stories, not histories.And story-tellers are interested in what makes a good story.So, take a real event (the fall of the Burgundians) and then toss in whatever will add spice to the tale: Attila! Siegfried! Dragons! People (e.g., Theodoric) who weren’t even alive yet! etc, etc,. "As for Siegfried, the narrative’s central hero, he is obviously pure myth. " There have actually been theories that Siegfried = Arminius, and the almost invincible dragon with his scales a mythical symbol for Varus' legionaries with their heavy armour and shields (https://de.wikipedia.org/wiki/Arminius#Arminius.E2.80.93Siegfried - can't find anything in English, sorry). Has to be admitted though that the proponents of that theory were mostly German nationalists with a pronounced interest in uncovering alleged Germanic continuities, and there is no real proof (and of course there can't ever be) for the theory. I'm really amazed though at the 8000 year Amerindian oral traditions about that volcano, that's fascinating. "As this shows, epics are stories, not histories.And story-tellers are interested in what makes a good story.So, take a real event (the fall of the Burgundians) and then toss in whatever will add spice to the tale: Attila! Siegfried! Dragons! People (e.g., Theodoric) who weren’t even alive yet! etc, etc,"
I actually believe that the desire to have a correct read of one's genealogy is not trivial. That Razib, a man of man possibilities, puts so much time and effort into this search seems to back this up. For whatever reason you seem not to want to extend the importance of the quest to those of earlier times. To present data you deem correct and then expect that those earlier had equal access to that knowledge but chose not to use it seems, at best to be knavish. Your possible superior knowledge has to do with the improvements of the data base others have made in the interim. Not better reasoning ability or motivation today. Razib, above, presents a difference in interpretation of certain facts in from those presented in the paper. He does not however accuse them of distortion to make a better story. Something you seem to be happy doing. Good teachers do know how to present material in a way that keeps their audiences interest. But without altering the core of the material presented. That seems the case here. I believe the countries with the highest proportion of red hair are Scotland and Ireland. It may be simplistic, but I incline towards thinking the original hunter-gatherer population of Ireland and Scotland had a lot of red hair alleles. The original European farmers being white skinned with dark hair and eyes (though not in Greece) is evidence for a disconnect between hair and eye and skin colour, with current north European appearance being the result of amalgamation/and or selection under agriculture. However, to me the case of redheads weighs against the amalgamation hypothesis, because AOTBE noticeably lighter lighter eyes hair and skin go with the red hair allele. Although it's not a proper country, it's actually the the Udmurts who have the highest proportion of redheads. Something like 70% of them are redheads, that's more than among any other ethnic group. not sure this panned out. the anatolian farmers had derived slc24a5. OTOH, they seem to segregate for slc45a2, which can make them brownish. the the irish woman was derived, so probably brunette white as i said. because AOTBE noticeably lighter lighter eyes hair and skin go with the red hair allele. from what i recall red hair is due a compound loss of function around MC1R conditioned on a bunch of of other things. its diversity has been suggested to indicate it introgressed (it's old). but i haven't followed up. i do think that the classical northern european complexion phenotype is due to amalgamation of different strands. probably dates only to the bronze, at the earliest. Tatarstan has a high, maybe higher rate of red hair. It's quite a trip to see fire red hair paired with high cheek bones and angled, almond shaped eyes (this includes some relatives of mine by marriage). And it may be that Cú Chulainn, the son of the god Lugh, who was a Tuatha de Danann, is a recollection of the emergence to maturity of am an who fused the blood of the old people with the new, and whose dark features bore testament to a race whose legacy was fading in the land? I work unscientifically backwards from the myth to the data but that’s my thinking also. How are the Bell Beakers related to the Corded Ware / Yamna culture? I guess they are genetically similar, are they a later migration from the same source? Greg Cochran somewhere wrote (I cannot find it for the moment, so my memory might betray me) that Bell Beakers brought genes for red hair, while the Yamna were blond. Is it likely based on what we know now? My problem with it is that red hair is most widespread in the northeastern part of Europe (Udmurts) and also in the northwestern part of the continent (British isles). In between as well as more or less admixed with them are the blonds, while dark haired people are also ubiquitous on the continent. I am so interested in the origin of red hair because I’m ginger myself. Yep – epic poetry is somehow un-English (Beowulf is Danish IIRC). Perhaps, that’s why I always found Tolkien to be irredeemably tedious. This version of the origin of the Gaels persisted well into medieval times in Scotland as well, and was cited at length as a justification for the independence of the Scottish kingdom in the 1320 declaration of Arbroath. [The document was a letter signed by the Scottish nobles to solicit Papal support for Scotland in the ongoing war against England, still going on sporadically after Bannockburn]. Obviously, it's pretty damn tough. In most cases (THE ILIAD, the Pentateuch, etc), we simply lack the proper controls (literary sources written down at a time reasonably close to the events in question). Hence, we have to rely on a combination of archaeology plus intuition.Was a city sacked at roughly the proper time? Does a given individual appear to be based on a real person? As this shows, epics are stories, not histories.And story-tellers are interested in what makes a good story.So, take a real event (the fall of the Burgundians) and then toss in whatever will add spice to the tale: Attila! Siegfried! Dragons! People (e.g., Theodoric) who weren't even alive yet! etc, etc,. There have actually been theories that Siegfried = Arminius, and the almost invincible dragon with his scales a mythical symbol for Varus’ legionaries with their heavy armour and shields (https://de.wikipedia.org/wiki/Arminius#Arminius.E2.80.93Siegfried – can’t find anything in English, sorry). Has to be admitted though that the proponents of that theory were mostly German nationalists with a pronounced interest in uncovering alleged Germanic continuities, and there is no real proof (and of course there can’t ever be) for the theory. I’m really amazed though at the 8000 year Amerindian oral traditions about that volcano, that’s fascinating. Yeah, I'm acquainted with the hypothesis.As you noted, it's largely a fringe-nationalist notion, and it does not carry much weight in scholarly circles. Too much special pleading, etc. And, while we’re at it, let’s use the lessons learned from The Nibelungenlied and apply them to The Iliad and The Pentateuch. Actual Historical Personages: ? Perhaps Paris, seeing as how the Hittite archives refer to an Alaksandu or Alaksandus (Paris is also called Alexander in The Iliad). Unfortunately, this possible prototype for Paris was a grown man circa 1280 BC (cf the treaty with Muwatalli II ), which indicates the kind of temporal scrambling that we saw in The Nibelungenlied (e.g., Theodoric being alive before he was born, the marriage of a Germanic princess occurring before the Fall of the Burgundians instead of after, etc). Other possibilities: Maybe Agamemnon? He seems like the kind of great King figure who might have been remembered in song, and Mycenae (his palace) was an important Mycenaean citadel.But that’s sheer speculation on my part. Clearly fictional: Achilles.Also Odysseus. Also Helen.Also, etc. Historical Kernel: ? Maybe the expulsion of the Hyksos?People have been toying around with this notion since Josephus. The problem, of course, is that the Hyksos were rulers of Egypt, not slaves. So, if this is the kernel, then it is a massively distorted folk memory with no historical value.Plus, the narrative of the conquest of Canaan bears no relationship to what the archaeologists have unearthed. Actual Historical Personages: ? Seemingly none.Tellingly, the Pharaoh is unnamed, a pretty good sign that he is a stock character and not modeled on a real person. Clearly Fictional: Pretty much everybody: Abraham, Isaac, Jacob, Joseph, Moses, Joshua, etc. Frankly, we probably don’t encounter real people until we get to Samuel and Saul and the United Monarchy.And by real people I mean real people like King Arthur or Dietrich of Bern, the Germanic epic version of Theodoric the Great. In other words, legendary figures who are very loosely based on real people. So, if David lived, he probably bears little to no resemblance to the figure that we meet in Samuel and Kings. Wasn't it the Picts who were said to have come from Scythia? I wish my grandfather were alive to see this. He told me that the Celts were from Scythia, and that the Irish had a Spanish component as well. He said his grandfather told him so. Perhaps his grandfather’s grandfather said so as well, and so on back in time. Of course, I’m sure it was a fairly commonly known story partly due to the Book of Invasions, but it was passed on by word of mouth for a couple thousand years before it was written down in the Middle Ages. It’s important to keep in mind that few Irish could even read until the 19th century (and even fewer could read Latin or Old Irish), but still they knew the story. Speaking of the physical traits mentioned in the paper, it’s interesting in that Ireland (all of Britain, actually) is quite physically diverse. In my own family, hair color ranges from black to light blond, eye color from blue to brown, and skin color from fairest white to tan to nearly mediterranean. My Welsh/Irish grandfather had black hair, fair skin and blue eyes. My Scots Irish mother has a darker, almost olive complexion, hazel eyes and brown hair. My sister is a blue-eyed, light blonde with alabaster skin. My Scots Irish stepfather’s family all have chestnut or red hair, and hazel or green eyes. It seems our different ancestries are still represented in our phenotypes today. It seems our different ancestries are still represented in our phenotypes today. yes, but please note that selection after admixture is a thing. the ancestral populations were all distinct looking, and none quite looked like northern europeans until after they'd pretty much mixed, and selection had changed the mix allele frequencies. Yeah, I’m acquainted with the hypothesis.As you noted, it’s largely a fringe-nationalist notion, and it does not carry much weight in scholarly circles. Too much special pleading, etc. Although it’s not a proper country, it’s actually the the Udmurts who have the highest proportion of redheads. Something like 70% of them are redheads, that’s more than among any other ethnic group. Peter Frost: Whereas Europeans have eleven MC1R alleles, Asians have only five, and all five produce the same black hair color (Harding et al., 2000). In short, Asians have fewer alleles and proportionately fewer of these differ phenotypically from the ancestral African allele. Peter has always said the diversity of eye and hair colours in Europeans is the giveaway. One of the reasons that the Bell Beaker People could walk all over the Irish in 2500 BCE was that agriculture had collapsed in Ireland with widespread reversion of hunting and gathering ca. 3400 BCE. Ireland was not consistently a country of farmers and herders when they arrived. My take is that Bell Beaker was a non-Indo-European, probably Vasconic (i.e. linguistical Basque language related) population from the south of the Steppe/Caucasus area roughly contemporaneous with Corded Ware that migrated to Southern Iberian in a “copper/tin” rush in the Chalcolithic and then expanded across Western Europe forming a technologically comparable bullwark against IE entry into Western Europe. They probably got their technology from a common source with IE people indeed, as to non-horsemanship related matter, probably got it from closer to the source which was probably also non-IE in the Caucasus. The dynamics were similar to Corded Ware but Bell Beaker was somewhat more prone to assimilate existing populations rather than obliterate them where the existing populations had sedentary farming already. In my view, IE arrived in most of Western Europe sometime between the 12th and 7th centuries BCE (with variation regionally), and replaced Vasconic languages with Celtic ones via elite dominance with little demic change. I suspect that the Minoans were part of the same linguistic family and that the Minoans arrived via Western Anatolia in Crete. Balkan or Anatolian is probably a better fit than Sycthian. I think you might be on the right track but very confused about the genetics. The BA Irish are not in any meaningful way "Vasconic". They have elevated EHG admixture so they fit the profile of a Yamna derived population. According to David of Eurogenes Basques have low EHG but higher CHG(Caucasus) that can't be explained by Yamna admixture alone, while still being mostly WHG and EEF. If he is correct(and I'm not 100% sure about that), it might be a better idea to connect early proto-Vasconics with haplogroup J2. 85% of Basques being R1b might just be a misleading founder effect in a presumably clannish people prone to such events combined with some later Celtic admixture. There were Scythians (Askuza in Akkadian or Ashkenaz in Hebrew) in Anatolia and Armenian Highlands (modern Kurdistan). Another related (probably Celtic) people were Cimmerians in Anatolian Galatia. This post is the exactly the kind of writing that attracts my eyeballs to this blog. I don’t know how Mr. Khan ranks in the genetic research world (probably not high as he is not a tenured professor yet), but he is the only one I know who seems to be extremely well-read in social sciences and humanities, and seamlessly incorporates genetics, the latest scientific research, current affairs, and relevant historical and cultural issues for the lay readers. And the commentary that follows such a post also appears to be very high quality. I always learn interesting, new things. Exactly. It’s just globalist propaganda. Trying to invent fake identities for ancient peoples and moving them around in theory to justify the Tower of Babel mix of today and the redrawing of borders. I doubt Irish literati writing in the 7th-9th century AD were thinking much of redrawing borders. Did you even read my post? from what i recall red hair is due a compound loss of function around MC1R conditioned on a bunch of of other things. its diversity has been suggested to indicate it introgressed (it’s old). but i haven’t followed up. Sorry I haven't read this when I wrote my previous comment. I am so interested in the origin of red hair because I'm ginger myself. the steppe people seem to have the derived form of kitlg, associated with blonde hair. The steppe people - including the Bell Beakers? My observations haven't been very precise but I have the impression from many years of observation that red facial hair is commoner than red hair on the scalp at least in adulthood. Pictures of me in early adulthood show reddish sideburns with brown hair while a portrait of me at age 8 shows a slightly reddish tinge in my fair-brown hair. My father apparently had red hair as a child though I don't remember him with red hair. What is known about the differences between facial hair and scalp hair? And what about body hair - perhaps subdivided further into chest hair (including back and shoulders I suppose), under arm, pubic, and leg and arm hair? Any ideas about randomness v. selection on each? Afterthought: presumably the tight curly hair on straight or wavy head hair people is a residue? But if it traces back to our ape ancestors why are Africans not as well covered in body hair as many out-of-Africa descendants? And that's just the men! I wish my grandfather were alive to see this. He told me that the Celts were from Scythia, and that the Irish had a Spanish component as well. He said his grandfather told him so. Perhaps his grandfather's grandfather said so as well, and so on back in time. Of course, I'm sure it was a fairly commonly known story partly due to the Book of Invasions, but it was passed on by word of mouth for a couple thousand years before it was written down in the Middle Ages. It's important to keep in mind that few Irish could even read until the 19th century (and even fewer could read Latin or Old Irish), but still they knew the story. Speaking of the physical traits mentioned in the paper, it's interesting in that Ireland (all of Britain, actually) is quite physically diverse. In my own family, hair color ranges from black to light blond, eye color from blue to brown, and skin color from fairest white to tan to nearly mediterranean. My Welsh/Irish grandfather had black hair, fair skin and blue eyes. My Scots Irish mother has a darker, almost olive complexion, hazel eyes and brown hair. My sister is a blue-eyed, light blonde with alabaster skin. My Scots Irish stepfather's family all have chestnut or red hair, and hazel or green eyes. It seems our different ancestries are still represented in our phenotypes today. yes, but please note that selection after admixture is a thing. the ancestral populations were all distinct looking, and none quite looked like northern europeans until after they’d pretty much mixed, and selection had changed the mix allele frequencies. The steppe people – including the Bell Beakers? "Scientists from Dublin and Belfast have looked deep into Ireland’s early history to discover a still-familiar pattern of migration: of stone age settlers with origins in the Fertile Crescent, and bronze age economic migrants who began a journey somewhere in eastern Europe." Sorry I haven’t read this when I wrote my previous comment. Articles on Unz.com are always very interesting, particularly those of Razib Khan, although I do not have very advanced scientific training. the title “The Gaels era from Scythia” reminded me of the work of a historian of the eighteenth century, Simon Pelloutier. For the author, the Celts are the Scythians, especially the Scythians living near the Danube river, at the foot of the Alps: European Scythians, which were also called the Hyperboreans. Pelloutier says that the Celts were formerly nomadic, they did not build anything and spent their lives in carts – they stopped only to graze their herds. People do say that about the Picts. Bede gives that account of Pictish origins, but it is “supposed to be confusing Scythia and Scandia, the Latin form of the Old English name for the southern part of the Scandinavian peninsula”. I actually believe that the desire to have a correct read of one’s genealogy is not trivial. That Razib, a man of man possibilities, puts so much time and effort into this search seems to back this up. For whatever reason you seem not to want to extend the importance of the quest to those of earlier times. To present data you deem correct and then expect that those earlier had equal access to that knowledge but chose not to use it seems, at best to be knavish. Your possible superior knowledge has to do with the improvements of the data base others have made in the interim. Not better reasoning ability or motivation today. I actually believe that the desire to have a correct read of one’s genealogy is not trivial. That Razib, a man of man possibilities, puts so much time and effort into this search seems to back this up. For whatever reason you seem not to want to extend the importance of the quest to those of earlier times. Actually, I'm quite interested in attempts to use modern gene-typing as a way to map human population movements, etc. I'm simply noting that legendary material has to be used with great caution. That's why I used the example of The Nibelungenlied. Here we can see how the mind of the story-teller interacts with genuine historical tradition. My take is that Bell Beaker was a non-Indo-European, probably Vasconic (i.e. linguistical Basque language related) population from the south of the Steppe/Caucasus area roughly contemporaneous with Corded Ware that migrated to Southern Iberian in a "copper/tin" rush in the Chalcolithic and then expanded across Western Europe forming a technologically comparable bullwark against IE entry into Western Europe. They probably got their technology from a common source with IE people indeed, as to non-horsemanship related matter, probably got it from closer to the source which was probably also non-IE in the Caucasus. I think you might be on the right track but very confused about the genetics. The BA Irish are not in any meaningful way “Vasconic”. They have elevated EHG admixture so they fit the profile of a Yamna derived population. According to David of Eurogenes Basques have low EHG but higher CHG(Caucasus) that can’t be explained by Yamna admixture alone, while still being mostly WHG and EEF. If he is correct(and I’m not 100% sure about that), it might be a better idea to connect early proto-Vasconics with haplogroup J2. 85% of Basques being R1b might just be a misleading founder effect in a presumably clannish people prone to such events combined with some later Celtic admixture. But that's the problem. Even the most" plausible" attempts involve lots and lots of juggling. giveaway for what? sexual selection? Red Hair was found in one of the Motalas hunter-gatherrs, they were also fair-skinned unlike the other WHG’s. which sample re: red hair? anyway, i've discussed the motala samples before. they were more fair-skinned, but not as fair-skinned as northern europeans today (they were segregated ancestral alleles you barely find in northern europe today, and are rare in even southern europe). But that’s the problem. Even the most” plausible” attempts involve lots and lots of juggling. For example, using that kind of methodology, I could argue that the story of Aeneas’ flight from Troy is a distorted folk-memory of the migration of the Etruscans…. Actually, I’m quite interested in attempts to use modern gene-typing as a way to map human population movements, etc. I’m simply noting that legendary material has to be used with great caution. That’s why I used the example of The Nibelungenlied. Here we can see how the mind of the story-teller interacts with genuine historical tradition. “Baba” stones are a type of stone statue, an idol. Their meaning and purpose is still debated. It is presumed that they are associated with the cult of the ancestors. These stone images, anthropomorphic stone sculptures, range in height from 1 to 4 m.
The earliest anthropomorphic stelae date to the 4th millennium BC, and are associated with the early Bronze Age Yamna Horizon, in particular with the Kemi Oba culture of the Crimea and adjacent steppe region. The simple, early type of anthropomorphic stelae are also found in the Alpine region of Italy, southern France and Portugal. Examples have also been found in Bulgaria at Plachidol, Vezevero, and Durankulak. The example illustrated above was found at Hamangia-Baia, Romania. The Cimmerians of the early 1st millennium BC left a small number (about ten are known) of distinctive stone stelae. Another four or five “deer stones” dating to the same time are known from the northern Caucasus. From the 7th century BC, Scythian tribes began to dominate the Pontic steppe. They were in turn displaced by the Sarmatians from the 2nd century BC, except in Crimea, where they persisted for a few centuries longer. These peoples left carefully crafted stone stelae, with all features cut in deep relief. The tradition was continued by Slavs and Prussians. If we look at the iron age baba stones and anthropomorphic crosses, we find thousands of them in the Slavic lands of Central Europe and in old Scythian lands of Eurasia. It seems that the only other place where they are found in Europe is Ireland. Who were the people who built Scythian Baba stones and anthropomorphic crosses in Ireland? How and when did they arrive there, and how come not a word can be read about them in any modern history of Ireland? The old histories of Ireland are not so silent. The old histories talk about Scythians who came to Ireland from the Caspian sea, but these old histories are ignored by modern historians as “fanciful” and “ridiculous”. Maybe it is time to look at the old Irish histories again. Red Hair was found in one of the Motalas hunter-gatherrs, they were also fair-skinned unlike the other WHG's. anyway, i’ve discussed the motala samples before. they were more fair-skinned, but not as fair-skinned as northern europeans today (they were segregated ancestral alleles you barely find in northern europe today, and are rare in even southern europe). A giveaway that each phenotypically differing MC1R allele's prevalence negatively affected the intensity of its selection. The selection could have been for disease prevalence and so it could be due to mere drift that those McC1R alleles which (wherever they originated) are currently most common in north Europeans are the ones to differ phenotypically. Still, I think it probably narrows it down a bit if appearance was in the mix of whatever selection was acting on. An alternative to Peter's hypothesis is people are color coded for some kind of disease resistance. http://www.unz.com/pfrost/a-modern-myth/ Many of these appear to be “disease polymorphisms.” If an epidemic sweeps through a community, it pays to have surface antigens that differ somewhat from your neighbor’s. The result is selection that inflates within-group variability, especially for the sort of structural proteins that are easy to collect and examine for studies on population genetics. If 70% of people in Finland had flaming red hair one would have to say the allele associated with it has, or had, some advantage at the far north, of Europe at least. A majority of of people in Finland are blond or or blondish admittedly. A giveaway that each phenotypically differing MC1R allele’s prevalence negatively affected the intensity of its selection. The selection could have been for disease prevalence and so it could be due to mere drift that those McC1R alleles which (wherever they originated) are currently most common in north Europeans are the ones to differ phenotypically. Still, I think it probably narrows it down a bit if appearance was in the mix of whatever selection was acting on. An alternative to Peter’s hypothesis is people are color coded for some kind of disease resistance. A giveaway that each phenotypically differing MC1R allele’s prevalence negatively affected the intensity of its selection. But there is a problem: if it would be so, you would expect the pattern to be uniformly heterogeneous. But that's not the case. For example red hair is 70% among Udmurts, maybe 10-15% among most other populations thought to be more or less redheaded, and most populations have 1% or less. Blond hair is a minority in most places, but in Northern Europe it's a majority (and so far as we know, has been so for millennia). So apparently blond hair's prevalence didn't negatively affect its intensity of selection in the North, but it did in Italy? And vice versa for brown hair? What about black hair, which is even less prevalent in the north than brown hair (the latter already a minority)? I think a more likely explanation is that the heterogeneous nature of European phenotypes is caused by an admixture of different populations. It's possible that there might have been some selection for uniformity in - say - China and no such selection took place in Europe, or - likelier - that there was simply a more recent expansion of one single source population in East Asia (and hence, more uniformity). Hair and eye colors are also more or less diverse in places like Afghanistan or Iraq (there was an Iraqi Baathist general who was a redhead complete with extremely white skin and I think freckles, too), but because of the climate blond and red hair and blue eyes are more or less selected against, so their prevalence is very low. A giveaway that each phenotypically differing MC1R allele’s prevalence negatively affected the intensity of its selection. The selection could have been for disease prevalence and so it could be due to mere drift that those McC1R alleles which (wherever they originated) are currently most common in north Europeans are the ones to differ phenotypically. there’s no evidence of selection right now. the model that these are old alleles is based on neutrality. MC1R may not even be subject to purifying selection http://bmcgenet.biomedcentral.com/articles/10.1186/s12863-015-0277-x in any case, there’s no evidence that each allele is phenotypically that different. people always ask me about peter’s model. after what we know about CHG and anatolian farmers i think the tundra hypothesis is falsified. Thus, at least in Spain, regions at opposite ends of the incident UV-B radiation distribution show significantly different frequencies for the melanoma-risk allele V60L (a mutation also associated to red hair and fair skin and even blonde hair),... Besides, using the 1000G south European data, we show that the V60L haplogroup is also characterized by an extended haplotype homozygosity (EHH) pattern indicative of positive selection. Bearing in mind that selection acts on phenotype, and there apparently are some phenotypical differences conferred by the MC1R variants in Europeans (but not Asians), the hair colours of north Europeans still seem to me to be more consistent with Peter's hypothesis than the alternatives. But there is a problem: if it would be so, you would expect the pattern to be uniformly heterogeneous. But that’s not the case. For example red hair is 70% among Udmurts, maybe 10-15% among most other populations thought to be more or less redheaded, and most populations have 1% or less. Blond hair is a minority in most places, but in Northern Europe it’s a majority (and so far as we know, has been so for millennia). So apparently blond hair’s prevalence didn’t negatively affect its intensity of selection in the North, but it did in Italy? And vice versa for brown hair? What about black hair, which is even less prevalent in the north than brown hair (the latter already a minority)? I think a more likely explanation is that the heterogeneous nature of European phenotypes is caused by an admixture of different populations. It’s possible that there might have been some selection for uniformity in – say – China and no such selection took place in Europe, or – likelier – that there was simply a more recent expansion of one single source population in East Asia (and hence, more uniformity). Hair and eye colors are also more or less diverse in places like Afghanistan or Iraq (there was an Iraqi Baathist general who was a redhead complete with extremely white skin and I think freckles, too), but because of the climate blond and red hair and blue eyes are more or less selected against, so their prevalence is very low. The Iraqi general in question. Search more pictures of him, he was extremely light-skinned and apparently he was blue-eyed, too. well, let's not forget lots of selection on pigmentation did take place. slc24a5 went from segregating, seems to have been brought by people from the near east (or at low frequencies in europe), and swept to 100%. My very Irish step-dad was his doppelganger. He hated when I made the comparison. OMG, my childhood’s idea that there is some common ancestry between Irish and Russians that explains propensity for drunkenness and the “tortured soul” self-expression is possibly true! there's no evidence of selection right now. the model that these are old alleles is based on neutrality. MC1R may not even be subject to purifying selection http://bmcgenet.biomedcentral.com/articles/10.1186/s12863-015-0277-x in any case, there's no evidence that each allele is phenotypically that different. people always ask me about peter's model. after what we know about CHG and anatolian farmers i think the tundra hypothesis is falsified. Thus, at least in Spain, regions at opposite ends of the incident UV-B radiation distribution show significantly different frequencies for the melanoma-risk allele V60L (a mutation also associated to red hair and fair skin and even blonde hair),… Besides, using the 1000G south European data, we show that the V60L haplogroup is also characterized by an extended haplotype homozygosity (EHH) pattern indicative of positive selection. Bearing in mind that selection acts on phenotype, and there apparently are some phenotypical differences conferred by the MC1R variants in Europeans (but not Asians), the hair colours of north Europeans still seem to me to be more consistent with Peter’s hypothesis than the alternatives. right, selection actions on phenotypes. also, the norton paper used whole sequence data not just snps. so it's more powerful. please don't go on google scholar to just find a paper which supports your viewpoint. that irritates me. though i do think the issue here is not solved, the talk about alleles is pretty irrelevant, as you indicate. selection acts on phenotypes. these alleles cause the same phenotype. , the hair colours of north Europeans still seem to me to be more consistent with Peter’s hypothesis than the alternatives. what's peter's hypothesis again? not what he says, but what you mean to indicate. nice piece. Kevin MacDonald is at work on a new book which will attempt a history of the White race and he is using the kind of genetic information that is presented here. Duchesne’s, The Uniqueness of Western of Western Civilization, discusses the same factors that are presented here, but without the complexities of genetics. has, and certainly he does not have the technical expertise. He is an historian. I suppose Mr. Khan will not respond, trying to maintain scientific disinterestedness, but if you read this, and have read Ricardo Duchesne’s book, I would like your opinion. My attempt to get a civilized response on the other thread by Anatoly Katlan was met by hysterics. i've heard of it. will check it out some day. the problem with duchesne (and kevin's) arguments from what i've seen is that "white people" as they understand it are very new products of admixture (~4,000 years or so). FTR I have no problems with Richard Lynn. correction, Anatoly Karlin, not Katlan. article on ancient Greeks. I wonder if you have an opinion of Richard Lynn’s IQ and Global Inequality, which the Karlin faction claims is not only false, but a lie. They do not provide a critique, or an alternative view based on science and statistics. Duchesne's, The Uniqueness of Western of Western Civilization, discusses the same factors that are presented here, but without the complexities of genetics. I suppose Mr. Khan will not respond, trying to maintain scientific disinterestedness, but if you read this, and have read Ricardo Duchesne's book, I would like your opinion. i’ve heard of it. will check it out some day. the problem with duchesne (and kevin’s) arguments from what i’ve seen is that “white people” as they understand it are very new products of admixture (~4,000 years or so). right, selection actions on phenotypes. also, the norton paper used whole sequence data not just snps. so it’s more powerful. please don’t go on google scholar to just find a paper which supports your viewpoint. that irritates me. though i do think the issue here is not solved, the talk about alleles is pretty irrelevant, as you indicate. selection acts on phenotypes. these alleles cause the same phenotype. what’s peter’s hypothesis again? not what he says, but what you mean to indicate. Motala 2 had two copies of the ancestral allele of rs1805008, the derived allele of which is also associated with red hair and fair skin. .
What is not speculation is the population that Motala came from died out completely. 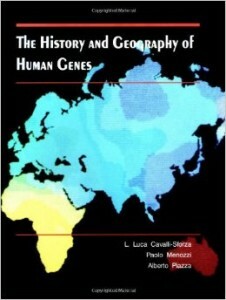 I mean to suggest that the steppe tundra population at the end of the Ice age (white and with hair/ eyes as light-diverse as could be) went to Doggerland and then (with a technological and cooperative facility from efficient fish processing giving them greater numbers) left when it sank and descended on the people of the high ground who were slaughtered. The low density peripheral populations like Motala and Loschbour were simply killed off. This was the first mass conquest in European history, and the winners' homeland lived on in the legend of Atlantis. well, let’s not forget lots of selection on pigmentation did take place. slc24a5 went from segregating, seems to have been brought by people from the near east (or at low frequencies in europe), and swept to 100%. But actually that was the point I debated - that (at least regarding eye and hair pigmentation, if not pigmentation of the skin) all of these alleles' prevalence negatively affected the selection for them. That sounds to me as if European conditions somehow were selecting for diversity, because (at least regarding eye and hair color) of course each trait's prevalence will negatively affect the selection for it, so for example redheads cannot reach more than maybe 15%, blonds maybe 50%, etc. etc. Sorry for my previous comment being misleading. *In a much weaker form, i.e. no selection against diversity of hair color. This is different from the original statement that there is selection against the highly prevalent hair colors and for the rare colors. I mean to suggest that the steppe tundra population at the end of the Ice age (white and with hair/ eyes as light-diverse as could be) went to Doggerland and then (with a technological and cooperative facility from efficient fish processing giving them greater numbers) left when it sank and descended on the people of the high ground who were slaughtered. The low density peripheral populations like Motala and Loschbour were simply killed off. This was the first mass conquest in European history, and the winners’ homeland lived on in the legend of Atlantis. interesting hypothesis re: doggerland. is that peter's or yours? re: whiteness. SLC24A5 is the key. the bet right now by researchers in this area is that it's from the middle east, not pleistocene europe. it seems to have been segregating in europe, but it was fixed in anatolian farmers and caucasian hunter-gatherers (though it was found in the bichon sample from switzerland as well as motala and in EHG i believe). the haplotype in motala is the same as in modern groups. i assume when we have more genomes we'll get a better sense. one thing to remember before the holocene is that much of europe was not inhabited. so you have to imagine populations expanding out of the margins and "crashing" together. but i wonder as to the connections between them. the anatolian farmers are modeled as a ~50:50 mix of 'basal eurasian' and 'whg.' is the latter whg from europe, or whg-like groups in the northern middle east? "What is not speculation is the population that Motala came from died out completely"
The NE Russians are not HGDP/Human Origins set's Russians who are represented here as North Russians, but from around Perm and Komi Republic. We can see that the heritage of Paleolithic/Mesolithic inhabitants of Switzerland and Luxembourg has survived better on the more remote regions of the continent. interesting hypothesis re: doggerland. is that peter’s or yours? re: whiteness. SLC24A5 is the key. the bet right now by researchers in this area is that it’s from the middle east, not pleistocene europe. it seems to have been segregating in europe, but it was fixed in anatolian farmers and caucasian hunter-gatherers (though it was found in the bichon sample from switzerland as well as motala and in EHG i believe). the haplotype in motala is the same as in modern groups. i assume when we have more genomes we’ll get a better sense. one thing to remember before the holocene is that much of europe was not inhabited. so you have to imagine populations expanding out of the margins and “crashing” together. but i wonder as to the connections between them. the anatolian farmers are modeled as a ~50:50 mix of ‘basal eurasian’ and ‘whg.’ is the latter whg from europe, or whg-like groups in the northern middle east? Thanks, it is my idea and stems from my conviction that Peter is substantially correct, though I am not as confident about skin as I am about hair and eye colours. There are lot of traces of flourishing human settlement in Doggerland brought up accidently by trawlers (including a 9000 year old human jawbone), so perhaps we will know quite soon. I suppose the original steppe-tundra population was very small, but it could have expanded given a move to an environment where food was more easily came by. The NE Russians are not HGDP/Human Origins set’s Russians who are represented here as North Russians, but from around Perm and Komi Republic. We can see that the heritage of Paleolithic/Mesolithic inhabitants of Switzerland and Luxembourg has survived better on the more remote regions of the continent. My observations haven’t been very precise but I have the impression from many years of observation that red facial hair is commoner than red hair on the scalp at least in adulthood. Pictures of me in early adulthood show reddish sideburns with brown hair while a portrait of me at age 8 shows a slightly reddish tinge in my fair-brown hair. My father apparently had red hair as a child though I don’t remember him with red hair. Many Jews of my acquaintance also in adult life seemed to have red sideburns without having red scalp hair and like people, such as myself, with whom they presumably shared Celtic genes, they underwent greying of the red hair before their darker hair. So…. What is known about the differences between facial hair and scalp hair? And what about body hair – perhaps subdivided further into chest hair (including back and shoulders I suppose), under arm, pubic, and leg and arm hair? Any ideas about randomness v. selection on each? Afterthought: presumably the tight curly hair on straight or wavy head hair people is a residue? But if it traces back to our ape ancestors why are Africans not as well covered in body hair as many out-of-Africa descendants? And that’s just the men! But actually that was the point I debated – that (at least regarding eye and hair pigmentation, if not pigmentation of the skin) all of these alleles’ prevalence negatively affected the selection for them. That sounds to me as if European conditions somehow were selecting for diversity, because (at least regarding eye and hair color) of course each trait’s prevalence will negatively affect the selection for it, so for example redheads cannot reach more than maybe 15%, blonds maybe 50%, etc. etc. Tatarstan has a high, maybe higher rate of red hair. It’s quite a trip to see fire red hair paired with high cheek bones and angled, almond shaped eyes (this includes some relatives of mine by marriage). One of the invasions in the Book of Invasions was supposedly from Spain. The Tuatha De Dannan, I recall. Today there are a lots of cultural similarities between the Gaels and the Gallegos of Spain – bagpipes and some linguistic stuff in the Galician dialect.